At Astricon this week and a few quick thoughts to share. More reflective thoughts will come later. 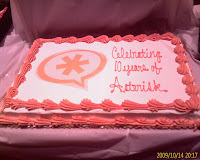 This year, Asterisk is 10 years old. This is the 6th Astricon Conference and reportedly the largest (barely) ever. It is still a very casual and friendly conference. Astricon is Digium’s technical conference – very technical. Everyone is approachable and available and happy to discuss the latest – including Mark Spencer himself. At most telecom conferences I feel a bit more technical than most attendees – not here. Mark rattled off this years award recipients. You can read about them here, but it is worth noting that these implementations are getting much bigger than I think most people assume. A pioneer in the Malaysian market, Intuit Innovations created a scalable solution able to support 130,000 existing subscribers and handle 10,000 concurrent calls. Taguig, Philippines implemented a unified citywide telecommunications system. Serving 73 sites. The implementation has already brought a 50% decrease in city costs while doubling city workers’ productivity. Danny Windham suggested next year’s Astricon award for scale will likely be at 50,000 simultaneous channels (10,000 this year). Digium keeps their cards close to their chest, but CEO Danny Windham is clearly nodding that Digium is profitable. Who would have guessed that the company giving away software is outperforming so many of its proprietary competitors. Google, Red Hat, and Digium seem to be on to something. The Asterisk crowd is definitely the rebel group – open source all the way. Few Microsoft fans here (Linux yes). Mark Spencer was spotted wearing his Kill Bill shirt, which is evidently Astricon tradition. As with most technical conferences, iPhones and Mac’s appear to be standard issue (what to do if Apple becomes the establishment?). This is the first voice conference I have attended where the cloud has clearly arrived. Cloud computing got its own technical track, and there are clearly lots of experts here with real experience with voice services in the cloud. I blogged last August about the Xchange conference (geared to general IT service providers) – where the cloud was only mentioned in hallway conversations. Switchvox is the Digium complete PBX. Not a favorite in this crowd that prefers customization abilities (AsteriskWorld is its spotlight). No major announcements on Switchvox at this event. Though last year, the brochures on SMB4.0 were still wet, so it was nice to see in more detail exactly what it can do now. For example, SMB4.0 introduced the Extend API for Switchvox. This year, there are several sessions on exactly how to use this API – it is pretty powerful. The API allows external applications to access the administrative functions on Switchvox – users, extensions, calls, and more can be created from totally separate systems. Extend is clearly intended to be a major strategy for Switchvox – every old feature the developers touch includes a re-write for use with Extend; over the years it will likely include an API call for just about every function on the Switchvox. The Switchvox user/web interface invites mash-ups. I’ve seen callerid result with Google Maps screen pops, but here Digium is showing their internal tweak of displaying employee photos (Flickr) on internal calls. The tools to integrate just about any web information are included and relatively simple – including some templates for popular systems such as SalesForce.com and SugarCRM. Both Switchboard and Extend provide significant customization opportunities for either the end user or the dealer. A portal on their website supports discussion and development with blogs, forums, and a new place for developers to demo/sell their customizations. Switchvox did show off their new server appliances. Blue and Black pizza boxes with an LCD display. Seems a bit odd to celebrate new boxes with so much talk about the cloud – but Switchvox for now intends to stay out of the clouds. Technically the software can be purchased stand alone and there are known EC2 implementations – but Digium believes the small business market is content with physical appliances for now. SMB4 really moved Switchvox out of the VoIP Switch category into the UC category with enhancements such as fax and presence. As usual, details on the road map were suspiciously vague (we will tell you when we know), but clearly internationalization is high on the list. I was hoping to hear more about mobility. Those plans are clearly being discussed behind closed doors only. The majority of the topics and conversation are appropriately about Asterisk. The economic “melt down” as probably been good for Digium as companies have been forced to redefine cost effectiveness in purchasing decisions. With Asterisk the key thing they monitor is download stats which are up 33% over last year’s record year. This also backed by research from Eastern Management Group that showed Asterisk is now commanding 18% market share suggests Asterisk crossed into the mainstream. Another indication is the new partnership with IBM on their Smart Cube product line. The Smart cube is business appliance offering simplified delivery, management, and support of various business applications. Today’s announcement adds Asterisk for SmartCube. Literally an VoIP Business Phone System module that can be activated in the cube. The product can support organizations up to 500 users – and leverages installed software as well as cloud services to create a resilient feature rich solution. The product won’t be a big hit with the Astericon DIY crowd, but certainly gives Asterisk yet another endorsement as a solid business solution. Digium is (re)launching three new websites. Asterisk Forge – capitulation (overdue) for all open source projects are to have a Forge site. This includes forums, mailing lists, and documentation. Asterisk Exchange (Announced): a new site planned for Q1 to facilitate end-users finding Asterisk applications and partners. The Exhibits Hall included lots of phones. Aastra was showing their new Dect models (watch this blog for a detailed review). Snom had their new wares which include the built in VPN capability. Polycom was here with their VVX1500 video phone and their new partnership with Ingenius software for quick XML application creation. Citel was here with their brilliant but overpriced solution to convert digital phones to SIP phones. Several new phone brands and even Cisco and Panasonic showed their SIP devices off. Sessions were great. Lots of good content. One final note: Twitter and blogging works. I met for the first time lots of people I already knew and versa visa if that makes sense. It was great to meet so many people I’ve met so far only online; particularly the VUC gang.